Hi there, everyone! I hope everyone enjoyed their holiday weekend! We celebrated Palm Sunday yesterday (we’re on a different calendar, so our Easter falls a week later this year), which is one of my mom’s favorite religious holidays to celebrate with family and friends. So we had a dinner party with my grandma (The YIA) and our good family friend S.
Palm Sunday is usually a traditional fish supper and my mom whipped up an amazing Asian-inspired feast. 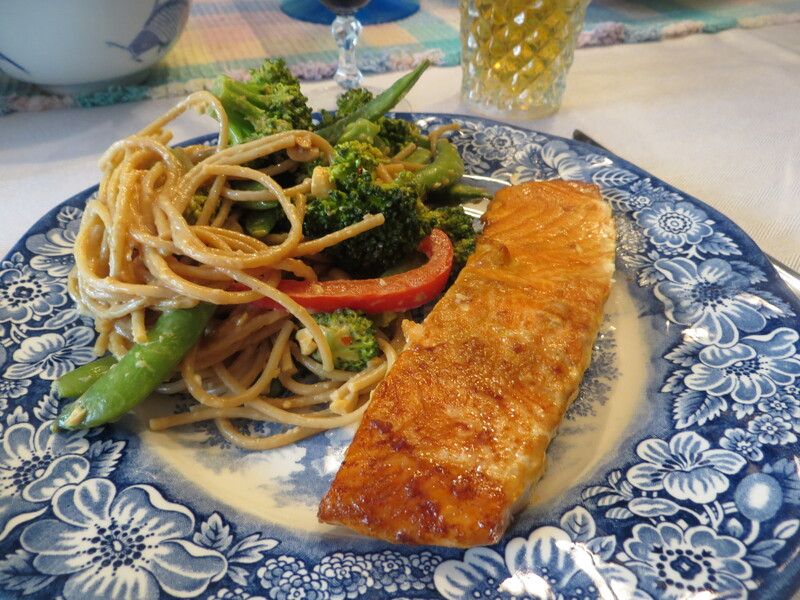 Ina Garten’s Asian Grilled Salmon and Ellie Krieger’s Aromatic Lime Peanut Noodles… delicious, nutritious, and absolutely beautiful when served on my favorite blue plates. But it wasn’t only Palm Sunday yesterday – it was also The Cat’s 11th birthday! So we had a huge dessert bar with chocolate cupcakes, sorbet, and a vegan Greek biscotti (recipe coming this week!). A sweet end to a festive day! How was your weekend, kiddos? What did you do/eat/see? Let me know! To those who celebrate, Happy Easter!! I hope everyone is enjoying this beautiful spring day! I cannot believe that today is Easter. These past forty days have flown by… I can’t imagine that the next big event will be graduation in a few weeks! Since last week was the week that I had my thesis defense, my Master’s Comprehensive exam rewrite defense, and a million other things due, E and I decided that a trip home to do nothing was the perfect option. And Easter in your home church is the best Easter there is. Plus The Cat is here. 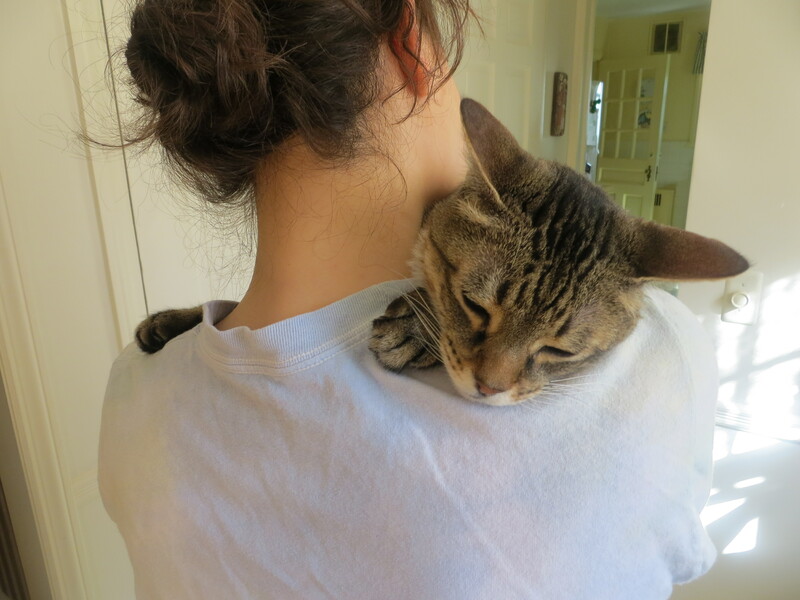 And nothing de-stresses you more than a good kitty cuddle. Since my day was full of eating, I decided to share my Easter morning with you today and my afternoon with you tomorrow. 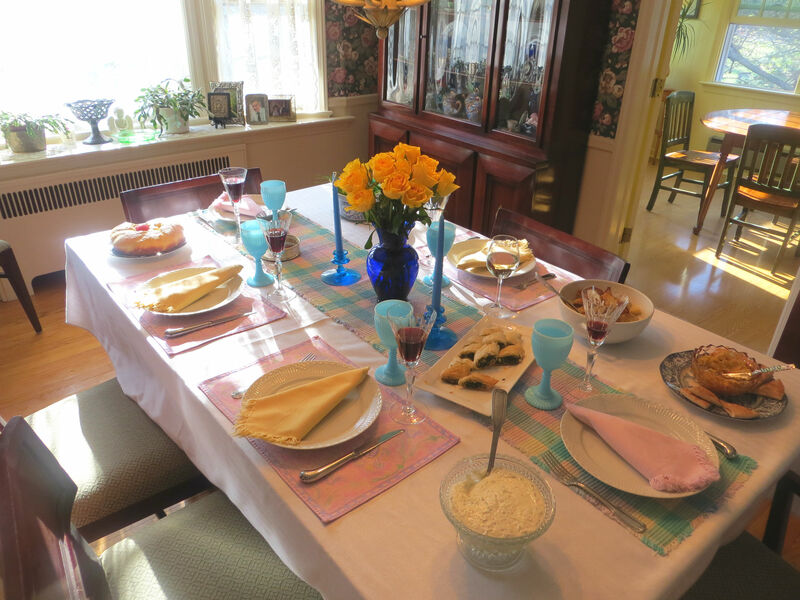 This morning was so fun, full of Easter candy and an amazing breakfast full of Greek traditions. Like the traditional sweet bread, tsoureki. 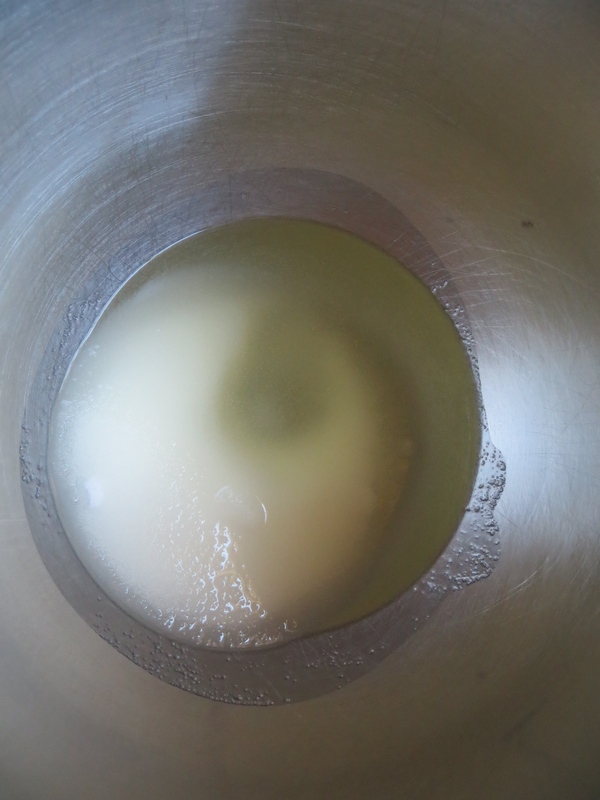 It is a dense bread that traditionally has a red egg placed in the center. It is perfect on the side of scrambled eggs or toasted and smeared with peanut butter (my post-Easter breakfast of choice). And eggs. Lots and lots of hardboiled eggs. Which E and I dyed with our mom on Holy Saturday – a family tradition. My mom puts them in a planter with grass, so it looks like the Easter bunny just placed them there… probably my favorite Easter tradition. Except for the game that Greeks play WITH the eggs. This game is simple – everyone grabs an egg and then take turns lightly smacking the ends together. E and I went first (skinny end vs. skinny end). I lost (but at least I have a great manicure!). Then my dad did fat end vs. fat end. Ultimately, the winner is the person with the whole egg or the least amount of broken ends… they are said to have good luck for the rest of the year. E was victorious this year (good job, E!). But let’s be serious for a moment… Easter morning was the first time I got to indulge in meat for the first time since Lent started. It was one of the best Easter mornings I had. So, kiddos… How were your Easter mornings? Did you binge on chocolate bunnies for breakfast? Went to midnight mass and had bacon cheeseburgers? I would love to hear about it!